This past weekend, at HeroesCon in Charlotte, NC, we launched our new campaign: “Love Yourself – Be Your Own Hero.” With the help of Sadie by Design, an awesome cosplayer and friend, we were able to get a picture with our new banner and lots of awesome cosplayers. As I have travelled along this cosplay journey, I have seen a lot of people struggle with insecurities and negative feedback that often prevents them from even starting out on a costume. I heard stories of people criticizing cosplayers because they are the wrong age, gender, body type, and so on to wear a costume. It broke my heart. Now don’t get me wrong, many times when I started out, I doubted if I had the qualities I assumed I needed to cosplay. But I also saw how much confidence I was gaining through cosplay and how I have watched other people blossom through this awesome hobby. When I started cosplay, I was going through two really challenging events in my life. Cosplay gave me a great artistic outlet where I could distract myself from the weight of these events. I picked characters that were strong, brave, powerful women – characters that I admired because they were what I was not. Soon I found that I was starting to find the characteristics that I admired in them becoming part of me. I found a strength in myself that I had not had before. Since I started cosplaying, I have met some wonderful new friends and fellow artists. One group of cosplayers that I met was the Heroes in Force team. They are a fun-loving, compassionate, wonderful group of guys and gals that use their cosplay to teach children about being a hero and not a bully. Truly a team of heroes! I was so impressed with what they did and how much their work impacted the community that they live in. I am honored to be a part of their team now and share this message with kids and adults alike. Since I joined the Heroes in Force team, I have also found many other cosplayers that have found a way to use their hobby to do good in their communities. I wanted to share this idea and spread it out into the cosplay world. We have a tool to reach people in a fun and fresh way. If you would like to learn more about this campaign, become a part of it or have us come speak at an event, email us at whiteknightcosplay@yahoo.com. 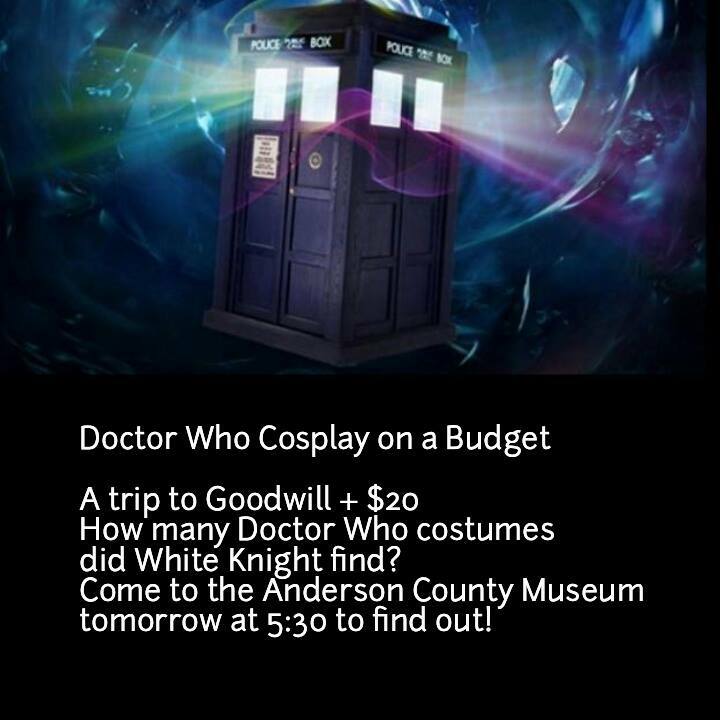 To wrap up my cosplay class series that I have been teaching this summer, I am doing a Doctor Who Cosplay class tomorrow night at the Anderson County Museum at 5:30. As a long-time fan of Doctor Who, I was excited to teach this class. Cosplay can be expensive and intimidating and I love to help fellow and future cosplayers find a fun, creative and inexpensive way to participate in this hobby. 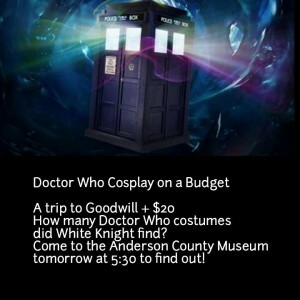 With several Doctor Who Days coming up, now is the time to be thinking about your costume. So, as a challenge to myself, I took $20 and a trip to Goodwill to see what I could find. I actually surprised myself with how much I found. Check out my post later this week to see what I put together. Welcome to my new site. Take a look around. I will be posting tutorials, blogs on the events that I attend, as well as updates on current projects I am working on. Feel free to contact me with any cosplay questions you may have.